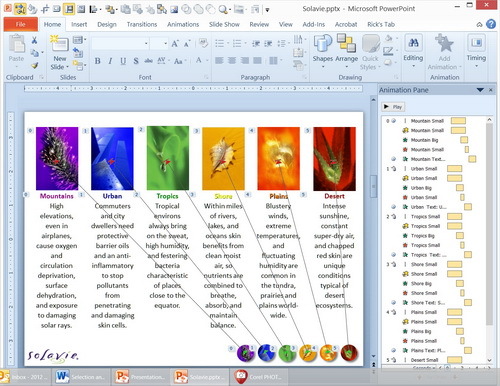 The best-kept secret of modern versions of PowerPoint? That’s a no-brainer, as I experience it almost every time I interact with users. When I am brought into an organization to consult on presentation skills, most in the room don’t know about it. When I give webinars, I can practically hear their oohs and aahs when I show it. And at the Presentation Summit conference, where 200 of the most earnest and passionate presentation professionals gather each year, I routinely get many dozens of users in a room producing a collective gasp. 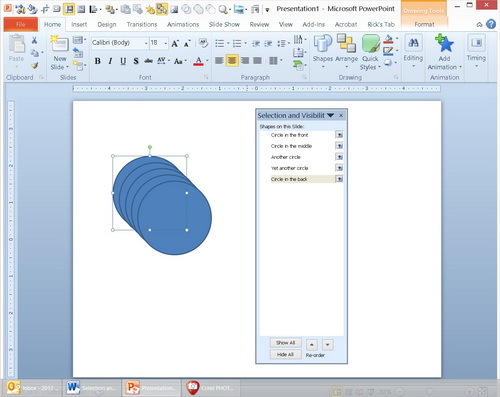 I refer to the Selection and Visibility Pane, introduced in PowerPoint 2007 and largely overlooked by most users of 2007 and 2010. I attribute this to two things: 1) This function doesn’t actually create anything; and 2) With lower-resolution displays, the icon shrinks to the size of a pinhead and most don’t even see it. The simplest virtue of S&V is the ease it affords you in selecting objects that are hard to reach with a mouse or even invisible to you. When objects overlap one another, reaching the ones on the bottom of the pile has traditionally required contortions, such as temporarily cutting or moving the ones on top or pressing Tab until you think the selection handles maybe kinda, sorta are around the desired object. Those headaches are all in your rearview mirror now, as Figure 1 shows. With S&V, you can select objects by clicking on their names in the task pane, bringing much-needed sanity to what should be a menial task. Once selected, you can do anything to an object that you otherwise would have. As I said earlier, this pane doesn’t really do anything except make it easier for you to do what you want. Figure 1 might look unusual to you because you had never laid eyes on S&V before, but there is another cause for a raised eyebrow: Circle in the front? Circle in the back? Where did those names come from? Most of you know what kind of names PowerPoint assigns to objects because you have been scratching your heads over them for the better part of a decade. Renaming objects becomes more than just a cute screenshot opportunity when you have complex animation to create. PowerPoint’s obtuse object names are duplicated in the Animation task pane and with ambitious animation needs, you could find yourself drowning in a sea of obtusity. With Rectangle 23, 24, and 25, which one enters first, which one moves to the center of the slide, and which one fades away? Arrghh! Case in Point: Solavie, the skin care product that offers formulations for six different earthly environments. To highlight these formulations, the six icons in the lower-right corner move and morph into the six photos across the top, after which each string of text cascades in. So lots of identical shapes doing similar things, one after the other – imagine pulling that off with typical PowerPoint names. But Figure 2 shows how powerful object renaming can be. Each object is named according to its environment type, making the animation process orders of magnitude easier. Now we have an elegant and simple solution: make an object invisible. Figure 3 shows the beauty and the genius of hiding objects, as the tail end of the Solavie animation gets the attention that it deserves. As you can see, when you hide an object, it leaves the animation stream, making late-stage testing a piece of cake. Here, just the final two environment types are still visible. The earlier four are still there, just temporarily hidden. Selection & Visibility lives on the Home ribbon in the Editing group. PowerPoint ribbons have a bad habit of changing right when you might want something on them, and that contributes to the anonymity of a small icon that is there one minute and gone the next. Indeed, there is no way to predict when you might want to use S&V. 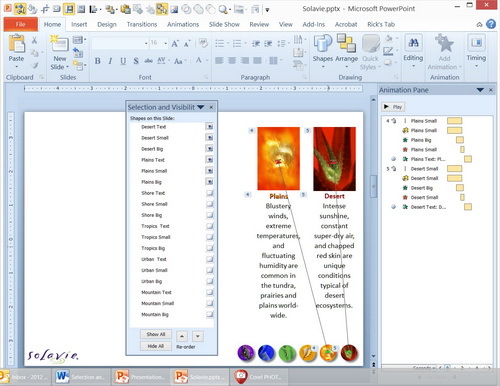 Creating, inserting, designing, animating – using S&V cuts across all contexts of PowerPoint operation. So it’s helpful to know about its keyboard shortcut of Alt+F10. There’s no mnemonic that you can apply to that shortcut – it’s as easy to forget as the function it belongs to. So you just have to commit it to memory. When you’re in the throws of creation, just press Alt+F10. Pretty good chance that little task pane will come in handy.